Again, let me reiterate: HAPPY BIRTHDAY TO ME! 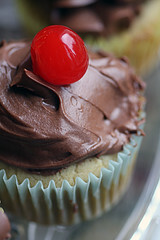 Here is a vegan chocolate frosted cupcake with a cherry on top. FOR ME ON MY BIRTHDAY.